Like a Fading Shadow (translated by Camilo A. Ramirez, review copy courtesy of Tuskar Rock Press and Australian distributors Allen & Unwin) is a fascinating, hybrid work, with a historical event at its heart. It focuses on ten days in 1968, when James Earl Ray (the man who shot Martin Luther King Jr.) was on the run in the Portuguese capital, desperately striving to receive a visa allowing him to escape to one of the country’s African colonies, where he would be able to disappear for good. The writer examines Ray’s movements during those ten days in great detail, tracing his movements through Lisbon as he goes back and forth between his shabby hotel, various embassies and the odd bar (where he went to pick up prostitutes). 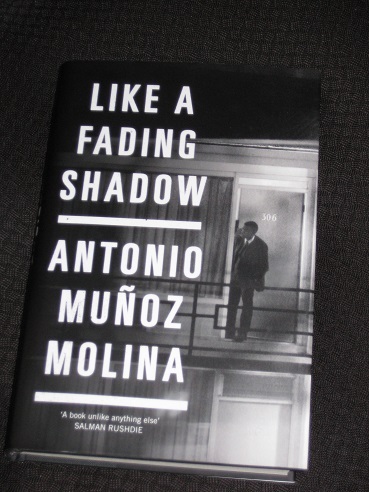 Muñoz Molina is an excellent writer, and this book was a pleasure to read. Ramirez has done excellent work here, with the writer recognisable as the one translated by Edith Grossman and Esther Allen in earlier books. A mix of memoir and fiction, historical reportage and speculation, Like a Fading Shadow is written using a variety of styles and perspectives. At times, the reader is encouraged to follow events through Ray’s eyes, while at others we are pulled back to Muñoz Molina’s viewpoint. There’s a difference too in how the information is conveyed, the clipped sentences when dealing with facts giving way to longer, conjectural sentences when the writer delves into speculation, with many examples of ‘I wonder how…’ or ‘He must have…’ peppering the text. Hiding in his hotel room during the day and walking through the streets of Cais do Sodré at night – he could not tell if he had managed to become truly invisible, to vanish like a fading shadow, like a gangster from a movie who can just get plastic surgery and all of a sudden look like Humphrey Bogart, or Ernst Stavro Blofeld, the supreme villain from James Bond, who can be fat, pale and bald in one novel, and slender, tan, with white hair in another. The writer painstakingly describes Ray’s efforts to blend in, including his nondescript clothes and the habit of never looking anyone in the eye. Time and again, the writer provides accounts of eye-witnesses who struggle to remember the American’s appearance the moment he leaves the room; it’s unsurprising that he stayed free for so long, even with the whole FBI on his trail. The ten days Ray spent in Lisbon make for an excellent subject for a book, so it may come as a surprise to find that Like a Fading Shadow is just as much (if not more so) about Muñoz Molina than the fugitive. The writer’s chapters are mostly set in the late eighties, describing a bored civil servant (c.f. In Her Absence…) and his struggles to make progress on the novel he’s writing. We learn of his double life as a worker and family man, and a night owl immersing himself in the world of the arts (and suffering through the hangover at work the next day). There’s a difficulty in balancing the two contradictory existences, particularly when his wife and son, who live in another city, come to visit. It’s then that he feels the frustration of the selfish writer, having to go on family walks and dinners when all he wants to do is shut himself up in his study and work on his novel in the midst of cigarette smoke and whiskey fumes. While this mixture of stories may sound a little confused and disjointed, somehow it’s anything but. The writer manages to carefully alternate between the two strands, drawing parallels between the visits to Lisbon and eventually expanding his scope. We learn more about Ray and his back story, circling around the fateful events of April the 4th, 1968, with the tension gradually building as the inevitability of his capture begins to sink in. Later, new elements are introduced, such as the writer’s later visit to Lisbon (to research *this* novel) and even, towards the very end, a section taking us to the Memphis balcony where a tired man is about to meet his fate. Like a Fading Shadow is wonderful book, absorbing and thought-provoking, whether your interest lies in the description of a world-famous killer or the self-justifying claims of a writer intent on finishing his book, whatever the cost. However, if there’s one minor nagging doubt I have about the book (and it’s one I’m sure most readers would have), it’s the feeling that there are two stories being told here, and the success of the novel hangs on how well the writer manages to integrate them. Is the book a coherent whole, or is there a slight sense that the structure is a tad forced? Certainly, the final sections focusing on King and the late revelations about Muñoz Molina’s private life do help to tie the ideas together more tightly, but a critical reader may well decide that the writer never quite manages to bring the two main ideas together sufficiently. I have read 4 previous novels by the author – but unfortunately not that one! And it also seems to be rather hard to get hold of. Like you I recently read El invierno in Lisboa in the original recently and really enjoyed the atmosphere and mystery. I certainly could be tempted to continue with Like a fading shadow although, having read your review of In the night of time, I might also go for that (in translation for comfort of reading’s sake).